UPDATE: Per Peterson, Professor and a former chair of the Department of Nuclear Engineering at the University of California, Berkeley, was kind enough to comment on yesterday’s post on the CBO study. Dr. Peterson noted that only about 1% of new nuclear plant construction cost is construction materials. So the theme attributing the rapid cost rises to commodity prices has no basis. Contrariwise, wind turbine construction/installation require at least 10x the materials input per kilowatt — so have higher sensitivity to price and availability of steel, concrete, copper, etc. I cannot accurately summarize in fewer words, so I recommend you read his comments carefully. 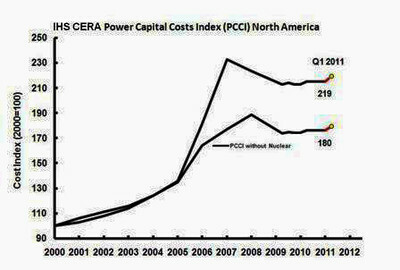 Dan Yergin’s Cambridge Energy Research Associates (CERA) maintains the Power Capital Costs Index (PCCI), depicted in the graphic at left – as of May 2008 [click on the thumbnail for full size chart]. In brief the PCCI shows that a power plant that cost $1 billion in 2000 would, on average, cost $2.31 billion in May [in constant 2000 dollars]. You can infer that the increase in the cost of new nuclear plant construction has increased by more than that 230%. As you can see in the PCCI chart the non-nuclear costs are up 180%. The PCCI is assembled from data on a basket of 30 power generation facilities in North America. I don’t know what percentage of the capital base is nuclear so I’ll speculate that it’s similar to the current 22% that nuclear contributes to US generation. That implies nuclear construction costs are up about 400% since 2000. I may be able to get more background from the CERA Capital Cost Analysis Forum – Power. But I discovered that viewing the replay of the June 6 webconference call required IE6, so I’ll need to fire up a windows PC to access it. …Demand for new power generation facilities remains high worldwide, leading to continued tightness in equipment markets. Cost increases, supply issues and longer delivery times are exacerbated as manufacturers struggle to keep up with demand. The weakening U.S. dollar also increases the costs of global procurement for equipment and materials. The number of engineers in the workforce is also declining as older workers retire and are not being replaced. The resulting shortages in plant design teams add additional delays to construction schedules. The current increase in construction for nuclear power generation and the dearth of experienced nuclear engineers in North America has been a key driver behind cost escalation. Recent cancellations of proposed coal plants in the United States due to uncertainty over environmental regulations has provided some slowing in cost increases in the U.S. coal industry. However, international competition for coal boilers, particularly in Southeast Asia, is keeping the equipment order books very active. Concerns over a looming U.S. recession and subsequent cut backs in residential construction have offered little relaxation to power construction. The residential slump does not free up the skilled workers required in the power industry and there is no overlap of the specialist metals and equipment required. I think we are looking at market reactions to an impulse in demand. In the short run [say 5 years] the supply of new nuclear plants is inelastic. Demand has increased considerably beyond expectations, so equilibrium is only achieved by higher prices. We are seeing similar supply/demand responses in several energy sectors. The headlines hammer on oil prices. At left is the Upstream Capital Cost Index (UCCI) — it is only 10% less than the PCCI. The UCCI is based upon a portfolio of 28 upstream oil and gas projects, so it represents the overnight cost of investment in field development and transportation. It may include finding costs, but I’m not sure. I do know that the cost per barrel-equivalent of finding + development costs has been increasing about as fast as oil companies have been able to ramp up their investments. The net result so far is no increase in reserve-additions, which are still lagging depletion. This entry was posted in Nuclear Power by Steve Darden. Bookmark the permalink. “only about 1% of new nuclear plant construction cost is construction materials” – sorry, I don’t think so. More like 30% at least. More like 30% at least. While it is widely understood that nuclear energy costs have quite low sensitivity to the cost of uranium, it is not widely appreciated that the same applies to construction materials. If one takes the total quantity of steel, concrete, copper, and other materials required to build a light water reactor similar to those operating today , and then multiplies these quantities by the respective current commodity prices, the total contribution of commodity inputs is $36 per kilowatt of generation capacity , out of total construction prices that are estimated today to range from $3000 to $5000 per kilowatt today. The dominant cost of nuclear construction is instead in the added value that comes from converting these commodities into an operational nuclear power plant. Conversely, wind turbines require approximately a factor of 10 times as much steel and concrete to construct without considering storage capacity , and thus have construction costs that are sensitive to commodity costs and to potential future resource scarcity. So he gave a range of 36/3000 to 36/5000 or 0.7% to 1.2%. Can you educate us on the construction cost buildup — also on why quotes have gone up so much since 2000?